Happy Holidays, friends. I thought I should start this post by saying I’m not aiming to depress you. If you hate talking or reading about death, then maybe this isn’t a nice post for you to continue reading. But if you could get to the end, maybe you would see the positivity in the post. March 14th – Three days before my birthday, Theresa, a close friend of mine passed away. August 13th – I was involved in a road accident, fractured my right leg. December 5th – Ifeanyi, close friend of mine lost his child during delivery. This was his first issue and I was so devastated by the news. December 11th – Chinedu, another close friend of mine, lost his father. And today, my motivator for this post; I went for check-up at the Orthopedics like I do every Monday, and the staff there told me that one of their out patients passed away sometime last week. Then I asked myself ‘Why so many deaths?’ This was a man who when I started walking with crutches encouraged me to ‘never pity the leg and always step hard on it’ so I’d become well on time. Then, he would tell me never to ‘always’ sit on one place and I should ‘always’ do my walking therapy. I know I’m not God and I can’t judge, but I think there’s been lots of death this year. We heard the world headlines – the Sandy Hook shooting, Aurora Cinema shooting, Dana air crash of June 3rd, lynching of four Nigerian students by an irate mob, the bomb blasts and killings in Northern Nigeria. A lot of sick stuff happening all over the world. Should we always dwell upon past events? No! I don’t think so, but thinking about all these tragedies makes you realize how fortunate you are to see the end of this year. That’s the most important part – surviving in a sick world. And all we can do now is to pray for, hope for, and work towards a new year; A Better 2013, where our dreams would come true, and we would hear less of the sick stuffs that happened in 2012, that year, which was supposed to end on the 21st of December but didn’t, because nobody really knows when the world is going to end. The deaths were so sad :( Imagine all those who have lost someone they love! Yeah, Tiana. So sad. I pray we see more positive news this year. Wish you the best!! There were a lot of deaths in 2012, and whilst we should remember them, we shouldn't dwell on them. We should look towards the future as that's what the ones who have left us would have wanted. 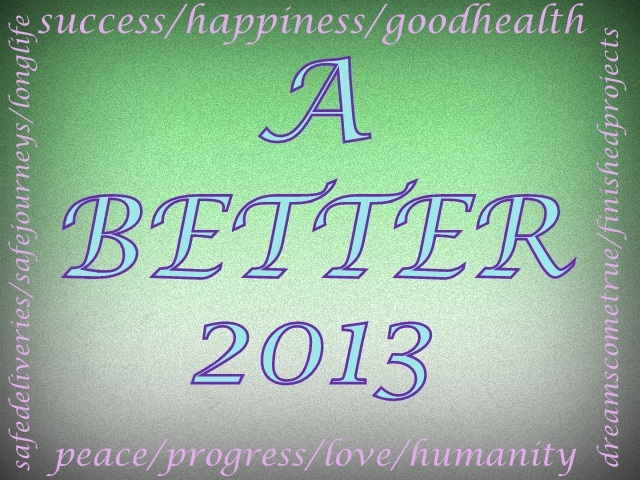 Great post, and I definitely wish 2013 has more positives! Thank you, Ruby. You were right about the ones who have left us wanting us to look towards the future, instead of dwelling on the past. Somehow, I can feel it - I believe this year will be better than the past year.